Description: The tiny flower heads are at the branch tips of a highly branched flower stalk. The individual flower heads have yellow disk flowers that are almost hidden among the slender, white rays. 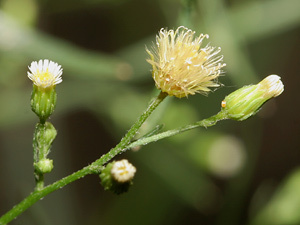 The flowers are followed by fuzzy seed heads with a tan to whitish pappus. The leaves are green, hairy, narrow, alternate, mostly linear, and crowded along the main stem. 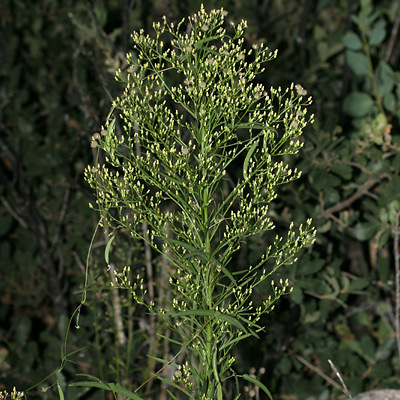 This tall, upright weed resembles a green horse's tail and is unbranched below and highly branched above. Allergenic – Skin contact with the foliage may cause contact dermatitis in susceptible persons. Edible – The young leaves and seedlings are edible if cooked and can be used as flavorings in other foods.